NEW 2019 Calendar is ready to ship! 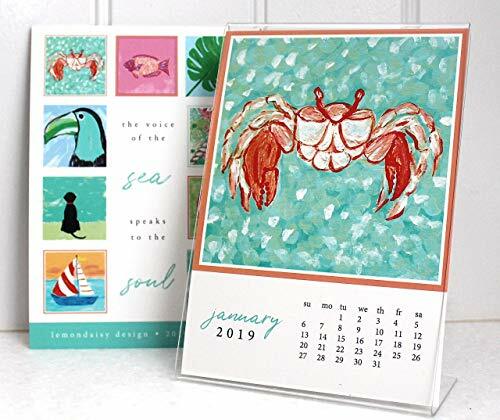 Happy Coastal Designs will brighten up your desk and make you think of someplace warm and wonderful all year long. Calendar comes packaged with a bow and is ready to give as a gift or keep for yourself. This calendar comes with a 5"x7" acrylic frame. After the year is over you have 12 5'x5" cute designs to frame. These make wonderful gifts for friends, family, neighbors, teachers and more! Monthly Designs: January - Ghost Crab February - Tropical Fish March - Monstera Leaf April - Sea Shells May - Palm Tree June - Jellyfish July - Patriotic Alligator August - Beach Dog September - Sea Turtle October - Sailboat November - Ibis Trio December - Coastal Santa Artist retains all reproduction rights and copyrights Listing items, images, and content 2018 Lemondaisy Design FOR PERSONAL USE ONLY. NOT TO BE RESOLD. If you have any questions about this product by Lemondaisy Design, contact us by completing and submitting the form below. If you are looking for a specif part number, please include it with your message.